With again a respectful nod to the Southern Publicity Department back in 1936 I am soon heading very South (well about 2 and bit hours in a plane south) for some exploration, rest, relaxation and hopefully some sun and sea too. There will, therefore, also be a break in posts on this blog with normal service being resumed week commencing the 30th June. 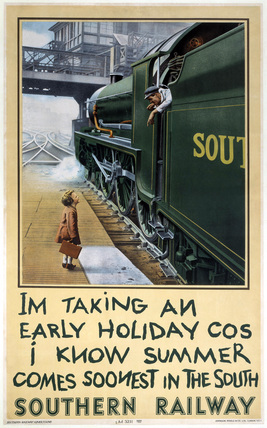 The now famous Southern Railway publicity poster ’I’m Taking and Early Holiday cos I know Summer Comes Soonest in the South’, was first released in 1936. It was dubiously parodied later by the Late and Never Early Railway, imitation being… etc. etc. The Photograph, originally in black and white, was taken in 1924 by Charles E Brown and shows a small boy carrying a suitcase on the platform at Waterloo station talking to the fireman of N15 King Arthur class 4-6-0 locomotive No 755 ‘The Red Knight’, as he leans from the cab. The Southern Railway publicity department had the image coloured for use on this poster the hint of the black and white original can be seen beyond the locomotive. I know this post is a cheat, as this is a repeat of a similar post from last summer, but I am already in holiday mode. If you are also about to head off on vacation or have one planned over the summer months then enjoy! Just in case you get withdrawal symptoms feel free to click here to view a totally random post, and for something to look forward to, I will be reporting back on the Bachmann future product announcements, as part of their 25th anniversary weekend, on the 20th July, so speak again soon.